Joining in with Jen's project over at little birdie. Finding happiness in simple things each week. Yay! 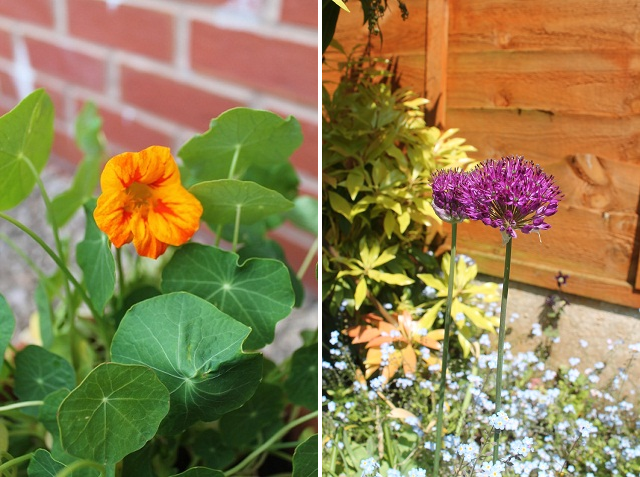 Summer has arrived in the UK and all the late spring plants have been putting on a sprint finish. Poppies, peonies and alliums have brought splashes of colour to our gardens. I noticed the first nasturtium bud in one of my pots at the weekend and by this evening it had opened fully. This morning I received a parcel from San Francisco from my late friend's daughter. It contained a CD of photos from her life and another CD of her favourite songs. The thoughtfulness of this and the reminder of my loss brought tears. This evening, as I've been browsing the photos on my laptop, my tears have been replaced by a surge of joy and happiness. Happy for such a thoughtful deed, happy for such a beautiful friend and happy for the wonderful memories that photos and music can bring. I love your poppies and nasturtiums too. My friend gave me some poppy seeds last year and i am eagerly waiting to see if they will flower.